Police claimed that the accused used house-breaking instruments to cut heavy locks of godowns in Outer Delhi. They would then scan the goods and shut the godowns with their own locks, added police. The goods were stored at a godown rented by the men. Police arrested two men for allegedly stealing over 50 imported toy cars and bikes Tuesday. They were arrested while trying to sell the stolen goods, said police. The duo, Ramesh Kumar (27) and Abhimanyu Singh (29), have previously been accused of running a gang and looting godowns, said police, adding that they are involved in over a dozen robberies. 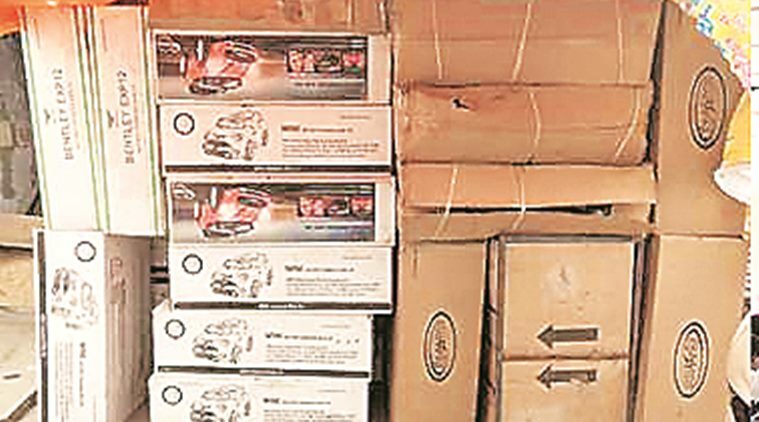 In the past, the accused have stolen toothpastes, soaps and motorcycle parts — but when they conducted a recce at a godown in Nangloi, they discovered a huge stock of miniature battery-operated Bentley toy cars, hooked up with a parental remote control and a 12-volt battery. The accused also made off with Mini Cooper bikes among other toys. “A total of 54 toys worth Rs 5,40,000 were stolen. We raided a godown owned by the accused, where we also found 800 cartons of bike accessories,” said Deputy Commissioner of Police (Outer) Seju P Kuruvilla. “They would return the next day with a group of people and act like the owner of the godown… and take all the goods while everybody watched. In cases where the godowns remained open during the day, they robbed them at night,” Kuruvilla said. According to police, in the present case, the complainant used to import toys from China and sell them at wholesale markets in Delhi. When the accused got to know about the miniature toys, they stole them and stored them in their godowns, which they had taken on rent. “They knew that disposing of more than 800 cartons would be a difficult job. It was also learnt that the accused could not sell their goods in Bihar and were looking at local markets to sell some of the stock,” Kuruvilla said. The accused have been sent to five-day police custody, said police, adding that they are trying to ascertain the identities of other gang members.